Impression Technology Europe (ITE) will use its presence at Labelexpo Americas 2018 to introduce its new Eclipse Mini label finishing machine to North America. It features self-wound lamination as standard, digital cutting, roll to re-roll, slitting and rewinding, and waste matrix stripping as standard. 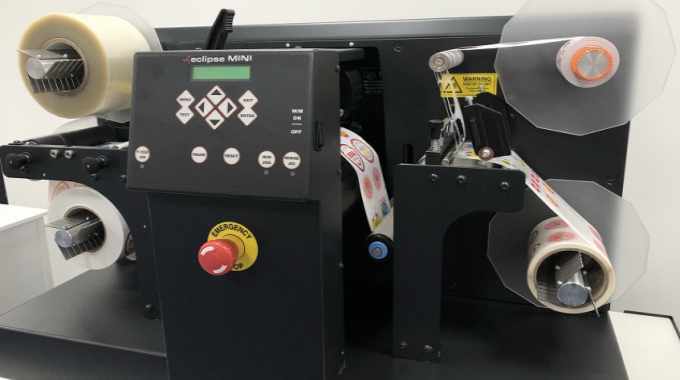 With a cut width of up to 112mm and the ability to cut plain or printed media with a single point registration system, Eclipse Mini is described as an economical investment designed to harmonize and increase the flexibility of label production from a range of low-cost narrow web label printers. Eclipse Mini is designed to complement the Epson ColorWorks C7500 and C7500g series and will be available to purchase through the Epson reseller program in the US. At 112 mm, the size makes Eclipse Mini suitable for continuous finishing of a wide range of media, such as BOPP, polyester, paper, vinyl and more. Eclipse Mini offers flexibility to the user for different shapes. It has the ability to cut labels on demand, and to any size without a die, meaning there is no need for surplus inventory – saving the cost of redundant pre-cut labels on shelf and reducing wait time. While it has a compact footprint, easy to use control panel and simple loading and unloading means that the Eclipse Mini is accurate, fast and economical, according to ITE. The company goes on to describe Eclipse Mini as a ‘production powerhouse in complete label converting and finishing’. The company noted this newly designed compact label finishing machine combines many features normally found on more expensive equipment, making it accessible and affordable to the market like never before. ITE managing director Roy Burton commented: ‘With the mindset shift in the industry in terms of embracing new technology, narrow web solutions are continuing to gain popularity within the label industry.